Bachelors Degrees in Biology, Chemistry, Doctorate in the Healing Arts, Director of Interactive Citizens United, Director of New Frontiers Institute, Inc. Prior Participant of FERC and FPAT (Fish passage advisory team report) and HET (Hatchery evaluation team) Prior Vice President of Greenhorn Action Grange, Prior California State Grange Spokesman for the Water Committee, Prior National Whip of the Property Rights Congress of America, Representative of the Grange States of California, Oregon, Washington and Idaho regarding EFH regulations, Prior member of the Siskiyou County Water Users Assoc and former Executive member of the RNC. It has come to our attention that the removal of four hydroelectric dams on the Klamath River is in violation of five federal laws in addition to exposing all in the affected areas to greter dangers should these dams be removed. Not only Oregon fires but consider the number of California fires that would have been much worse without the reservoirs from these dams. Thank you for your understanding of the seriousness of this proposed action. Proposed dam removal will kill all fish and wildlife dependent on the Klamath for ten years or more. Fire danger will increase without reservoirs used by fire helicopters and homes, businesses and towns along the river will be subject to severe flooding without the dams protecions. It will also destroy thousands of acres of agricultural lands in northern California and Southern Oregon. Elections in Siskiyou County California and Klamath County Oregon voted 80% to retain the dams and removal of these dams would be in direct violation of the will of the people and the Constitution. Jackson County in Oregon has also indicated that their voters also want the dams to remain to assure them of irrigation waters and power costs. The Reclamation Act of 1902 (43 U.S.C. 391 et seq.) authorized the Secretary of the Interior to locate, construct, operate, and maintain works for the storage, diversion, and development of water for the reclamation of arid and semiarid lands in the western States. Congress facilitated development of the Klamath Project by authorizing the Secretary to raise or lower the level of Lower Klamath and Tule Lakes and to dispose of the land uncovered by such operation for use under the Reclamation Act of 1902. Starting around 1912, construction and operation of the numerous facilities associated with Reclamation’s Klamath Project significantly altered the natural hydrographs of the upper and lower Klamath River. Reclamation’s Klamath Project consists of an extensive system of canals, pumps, diversion structures, and dams capable of routing water to approximately 200,000 ac (81,000 ha) of irrigated farmlands in the upper Klamath Basin. Water diversions from from UKL for the Klamath Project affects river flows downstream of Link River and Iron Gate dams. It has come to my attention that in section 372 of the Act the water right becomes an integral part of the property and cannot be taken or reduced. The headwaters of the Klamath River originate in Southern Oregon and flow through the Cascade Mountain Range to the Pacific Ocean south of Crescent City, California. The river extends nearly 250 miles and is just one of three waterways that pass through the Cascades to the Pacific. It is named after a native American name - klamet - meaning swiftness. The Klamath River was designated a Recreational River within the National Wild & Scenic Rivers System in 1981. The Klamath River enters California from Oregon just north of the Goosenest Ranger District. Heading west it is impounded by two dams forming Copco Lake and Iron Gate Reservoir. Nine miles further west it turns south and follows Interstate 5 for a few miles before again turning west and entering the Happy Camp/Oak Knoll Ranger District. The next 85 miles provide many opportunities for recreation and scenic vistas before the river enters the Six Rivers National Forest. Dam removal would release toxic material that would destroy the habitat for all species in addition to physically changing the course of the Klamath River in direct violation of the National Wild & Scenic Rivers designation. No State may impose any regulatory action against navigable rivers in the US of which the Klamath River is considered a navigable river. This would also prohibit removal of any dams located on a navigable river in the US by States. Under the Federal ESA only indigenous species can be listed and under the Final report of Coho Salmon by the Klamath Expert Panel Coho Salmon were planted from Cascadia, Oregon and are not indigenous to the Klamath. In early September 1999, federal district Judge Michael Hogan agreed, throwing out the coho's status as threatened under the Endangered Species Act. I have discovered that the proposed removal of four hydroelectric dams on the Klamath are also in violation of the Klamath River Basin Compact which was ratified by Congress on August 30, 1997. Hydro electric dams supply Northern California and most of Oregon homes and businesses with the least expensive power available. The average homeowner is liable for approximately $200 per month and with the proposed natural gas power supply it would increase their costs to approximately $600 per month. At the present time Shasta Indian Tribe burial grounds are protected by Iron Gate Reservoir and removal of this dam their burial grounds could be exposed, plundered and desecrated. We have documentation from both the Shasta Nation and Karuk tribe denying Coho were indigenous to both the Rogue Valley and Klamath basin. Removal of these dams would be in serious loss of existing water rights as proposed solutions to avoiding this problem would be in serious possibility of failure and exposed to vandalism. Due to occasional flooding Iron Gate Dam was constructed to serve to protect all that lived on the banks of the Klamath River from catastrophic flooding events. Without this dam property values would fall and expose all with the possibility of loss of life and property. At the present time the dams supply fire helicopters access to water supply to fight forest fires. 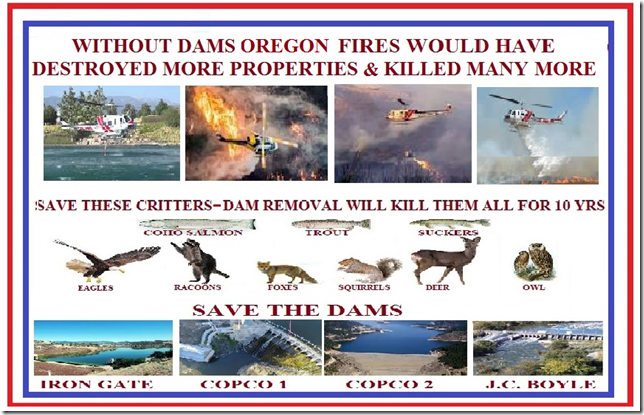 Removal of these dams would force said fire helicopters to much longer time delays to fill their buckets and thereby expose all to longer wait times and possibility of loss of lives and property. In the late 90’s a proposal was made to change the definition of Federal ESA regulations regarding endangered salmon to Ecological Society of America regulations which means that instead of regulations applying only to water and substrate would be changed to allow them regulations up to a mile from the banks of a river. Through the States of Idaho, Washington, Oregon and California State Granges we defeated this change. In the early 2000’s the Granges engaged Pacific Legal Foundation and listings of Coho in Northern California and Southern Oregon were cancelled as the Coho were not indigenous to these waters and rivers. In the mid 2000’s an attempt was made by environmental groups to list Chinook Salmon in the upper Klamath and the Siskiyou County Water Users Association filed a de-listing petition which was successful and the Chinook listing was denied.